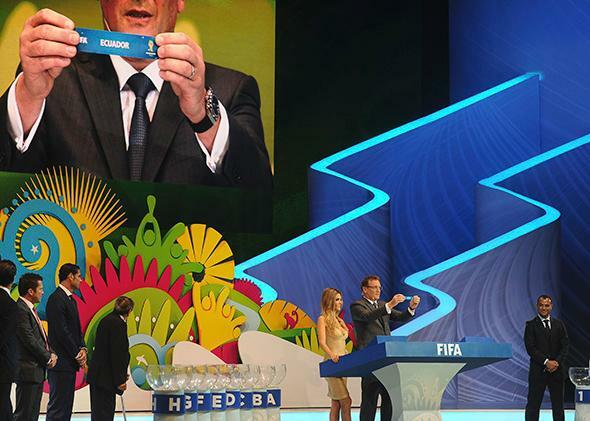 World Cup draw: FIFA dreams of a peaceful, united tournament at the draw ceremony in Brazil. FIFA dreams of a peaceful, united World Cup at the draw ceremony in Brazil. Plus: How will the USA fare? FIFA Secretary General Jerome Valcke shows the paper reading the name of Ecuador during the final draw of the Brazil 2014 FIFA World Cup, in Costa do Sauipe, Bahia state, Brazil, on Dec. 6, 2013. Nelson Mandela’s last major public appearance came on July 11, 2010, at the World Cup final in Soweto. Wrapped up against the bitter cold in a long black coat and fur hat, he perched stiffly on the back of a golf cart that emerged from the tunnel and made a brief circuit around the middle of the field. You couldn’t deny the thrill you felt at seeing this world figure among us: He hadn’t been on the VIP list, nobody knew whether he was going to come, but he’d made it. And yet, something about it felt wrong. We all knew that in 1995, Mandela had presided at the Rugby World Cup final between South Africa and New Zealand at Ellis Park. At Johannesburg’s Apartheid Museum, a photo exhibition of Mandela’s life culminates in the picture of him in the Springbok jersey and cap, handing the Webb Ellis Cup to South Africa’s Boer captain, Francois Pienaar. It’s the single most famous image of the racial reconciliation he inspired. By the time the soccer World Cup final took place in South Africa, Mandela was a week short of his 92nd birthday. He wasn’t strong enough to take any meaningful part in the proceedings. He couldn’t stay to watch the match. He could hardly lift his arm to wave. Mandela’s grandson, Mandla, had revealed on the morning of the final that the family had “come under extreme pressure from FIFA requiring and wishing that my grandfather be at the final today.” Everybody knew the family had been in mourning since the death of Mandela’s 13-year-old great-granddaughter, Zenani, in a car accident on the eve of the tournament. So that night it looked as though FIFA’s craving for a Pienaar moment had superseded concern for the welfare of an old man. As Mandela’s golf cart reached the sideline, FIFA President Sepp Blatter swooped amid a blaze of flashbulbs to seize his gloved hand. Nobody remembers the photographs. Blatter didn’t show his workings on that one, but it’s not his style to do so. For instance: “[Mandela] and I shared an unwavering belief in the extraordinary power of football to unite people in peace and friendship, and to teach basic social and educational values as a school of life.” Today, Blatter called for a minute’s silence for Mandela at the draw, then interrupted the silence after just a few seconds to call for applause. The game’s extraordinary power to unite people in peace and friendship is not shared by its governing body. Brazil has simmered with social unrest since the huge protests at the time of the Confederations Cup, and the new World Cup stadiums have come to be seen as symbols of endemic corruption. FIFA says it has come to Brazil to have a party, but it’s taking no chances with the security arrangements. 3,600 armed guards were deployed to watch over the draw. There were three armed guards for every four accredited guests. Foreign media have speculated that the protest movement could disrupt the World Cup. It seems unlikely, because what Blatter says about football is true, in a shallow way. Anyone who has been to a major football tournament will have seen how the host country tends to succumb to the collective dream. Most people are inclined to have a good time, and tournaments are a great way to do that. They don’t solve any problems, and the sense of euphoria and unity quickly fades—but by the time that happens, FIFA will be safely back in Zurich plotting Russia 2018. The draw has worked out well for the Brazilians, whose group is easy enough to win comfortably, but tricky enough to keep them on their toes. The key game will be against Mexico in Fortaleza, and there Brazil will have the motivation of avenging their defeat in last year’s Olympic final. Croatia will be weakened by the suspension of center-forward Mario Mandzukic. Mexico, who were so lucky to qualify, now look well-placed to progress to the second round. Group B will open with a reprise of the match that followed Mandela’s circuit around the pitch in Johannesburg: Spain against the Netherlands, in steamy Salvador. The 2010 final was chiefly memorable for Nigel de Jong plunging his studs into Xabi Alonso’s chest. Holland are less violent these days, but Spain still have the edge in class. Chile are an energetic, talented side who have a puncher’s chance against the European sides. Australia will be lucky to go home with a point. Ivory Coast have been unlucky in their two previous World Cups—in 2006 they landed in a group with Argentina and Holland, and in 2010 it was Brazil and Portugal. Group C will be their weakest-ever World Cup group, so it’s unfortunate that they’ll be bringing their weakest-ever World Cup squad. Japan and Colombia are the sides most likely to progress. Greece battled gamely in the Euros last year, but they’ve yet to play well at a World Cup. England coach Roy Hodgson specified before the draw that he was more concerned about where his team played than who they played, and that he particularly didn’t want to play in the jungle city of Manaus. Naturally, England will start their campaign against Italy in Manaus, in a match that kicks off at 2 a.m. English time. The English FA chairman Greg Dyke was captured on camera reacting to the draw by miming cutting his own throat. There are all kinds of juicy narratives for the English media to have fun with. The most tantalizing concerns England’s match against Uruguay and the English national hate figure Luis Suárez, who last year became one of the few athletes to be booed at the London Olympics. Italy’s tournament smarts make them the favorites for the group, with Uruguay or England fighting to join them in the second round. The obvious conclusion after France’s last three tournament showings was that the players simply didn’t like international tournaments and would rather not have to go to them. In the event, they scrambled into this one in the manner of Indiana Jones with a dramatic playoff win against Ukraine, and their reward is to be placed in the easiest group, along with Switzerland, Ecuador, and Honduras. Switzerland’s inability to score against Honduras got them knocked out of the last World Cup after they’d beaten Spain. This time, they should make the second round along with France. Argentina’s tournament will be all about Lionel Messi and whether he can finally dominate a World Cup—the one thing his few critics can argue he hasn’t yet done—and in so doing, stake a claim to be the greatest to have played the game. Messi is well aware of this, which puts him under pressure. However, Argentina’s talented squad might see the chance to steal the World Cup from under the noses of the Brazilians as a great laugh. If Brazil and Argentina both win their groups, the structure of the draw means they could only meet in the final. If Messi can’t dominate a group featuring Bosnia-Herzegovina, Nigeria, and Iran, maybe the critics are right. Americans who don’t love soccer might wonder about the limited range of opponents the World Cup tends to throw up for the U.S. team. If FIFA has 209 members, why does the United States always end up playing the same few countries? The best thing about Group G from an American point of view is that this time, Ghana can’t actually knock them out—unless they face them again in the final. Whatever happens in that opening game in Natal, the United States can progress as long as they defeat Portugal and Germany. They dispatched a Portuguese team of similar quality to today’s in the 2002 group stages. They lost to a German team of vastly inferior quality to the 2014 vintage in the quarterfinal, but only thanks to the Hand of Frings. The point is that football is unpredictable, and near-miracles do happen. Which is just as well, because the U.S. team needs one. Neutral interest will center on the performance of Germany. The third-favorites for the tournament have won style points and admirers in recent years, but their failure actually to win anything is becoming increasingly awkward. Italy’s victory over them in last year’s Euro semifinals exposed a glass jaw. The opener against Portugal will subject Germany’s credentials to an early test. Belgium are a difficult side to assess: lots of great individual players, little tournament experience. They’re lucky to have been placed in a winnable group. Russia are paying Fabio Capello a lot of money, but it is difficult to imagine their players paying much heed to him, and South Korea can’t compete with Belgium’s class. Algeria may well compete for second place.